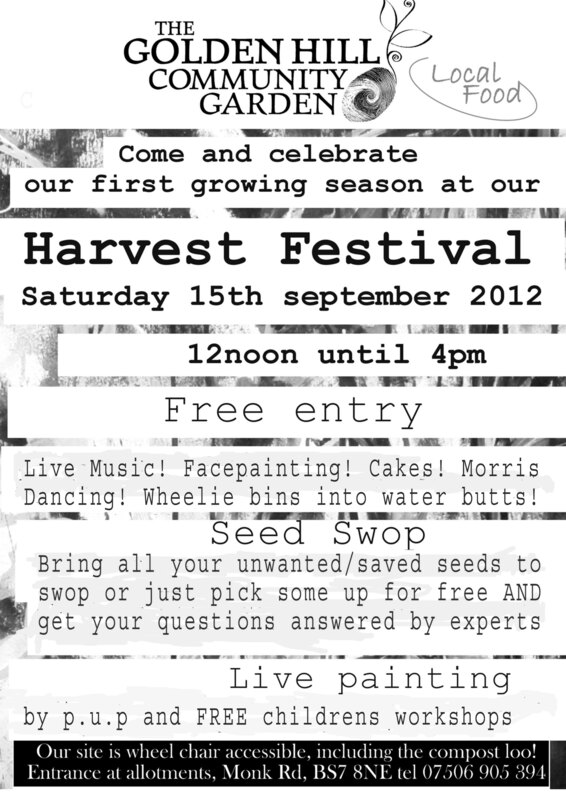 Below is the flyer for the Harvest Festival which is only 11 days away!! Thanks Sheena leader of the p.u.p (Pick up a pencil) group. Some more info not on the flyer is the ever popular Pip’s Jukebox made it back from the festival circuit alive and will be joining us back in the shed stage playing your requests through the day. The fabulous Pigsty Dancers will be doing their thing at 2pm and other music will be happening during the day. Whooop! The seed swap is a little early in the year but a really good chance to get some free seeds and/or offload lots of your old seeds so you don’t feel guilty about buying fresh in. If you’ve saved any seeds this year then please bring along any spares. We’ll also have info and advice about seed saving you can still do this year. There’s still space to volunteer if you’ve some spare time on the day and please please please bake and donate cakes. Last time the refreshment tent was a vision of paradise and I’m hoping for a repeat of that. Other allotment news is Lloyds sent along three bunches of hardworking volunteers last week and it. Was. Great. The combined energies of 35 people who started all at once, happy to be off the office and blitzed the dirty jobs we’ve been avoiding/not able to do this wet summer was fantastic… AND they paid for the materials and have fundraised for us. We now have hard standing path for pond and new poly tunnel AND the trenches have been dug for the new polytunnel. Thanks guys!! Which means if the sun shines then we’ll have the tunnel up tomorrow after 6 months of waiting. I am so happy about this. This entry was posted in News from the Garden on September 4, 2012 by GHCG.